I shall never forget my first sight of the Somme battlefields. It was snowing fast, but the ground was not covered, and there was this endless waste of mud, holes and water. Nothing but mud, water, crosses and broken Tanks; miles and miles of it, horrible and terrible, but with a noble dignity of its own, and, running through it, the great artery, the Albert-Bapaume Road, with its endless stream of men, guns, food lorries, mules and cars, all pressing along with apparently unceasing energy towards the front. Past all the little crosses where their comrades had fallen, nothing daunted, they pressed on towards the Hell that awaited them on the far side of Bapaume. Never shall I forget my first sight of the Somme in summer-time. I had left it mud, nothing but water, shell-holes and mud—the most gloomy, dreary abomination of desolation the mind could imagine; and now, in the summer of 1917, no words could express the beauty of it. The dreary, dismal mud was baked white and pure—dazzling white. White daisies, red poppies and a blue flower, great masses of them, stretched for miles and miles. The sky a pure dark blue, and the whole air, up to a height of about forty feet, thick with white butterflies: your clothes were covered with butterflies. 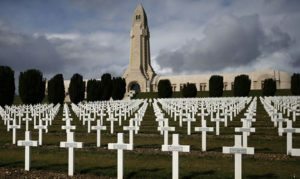 It was like an enchanted land; but in the place of fairies there were thousands of little white crosses, marked “Unknown British Soldier,” for the most part. (Later, all these bodies were taken up and nearly all were identified and re-buried in Army cemeteries.) Through the masses of white butterflies, blue dragon-flies darted about; high up the larks sang; higher still the aeroplanes droned. Everything shimmered in the heat. Yet, on this day, looked forward to for years, I must admit that, studying people, I found something wrong—perhaps, like all great moments expected, something is sure to fall short of expectations. Peace was too great a thing to think about, the longing for it was too real, too intense. For four years the fighting men had thought of nothing except that great moment of achievement: now it had come, the great thing had ceased, the war was won and over. The fighting man—that marvellous thing that I had worshipped all the time I had been in France—had ceased actively to exist. I realised then, almost as much as I do now, that he was lost, forgotten. “Greater love hath no man”—they had given up their all for the sake of the people at home, gone through Hell, misery and terror of sudden death. Could one doubt that those at home would not reward them? Alas, yes! and the doubt has come true. It made me very depressed. The one thing these wonderful super-men gave me to think that evening was: “What shall we do? Will they do as they promised for us? I gave up all my life and work at home and came out here to kill and be killed. Here I am stranded—I cannot kill anyone any more, and nobody wants to kill me. What am I to do? Surely they will give me some job: I have done my bit, they can’t just let me starve.” “When you come back home again”—yes, that crossed their minds and mine for them. Orpen himself was sidelined with blood poisoning, and when he recovered, he was called to Versailles where he had a commission to paint the occasion of the signing of the Treaty that would guarantee that there would be another war. 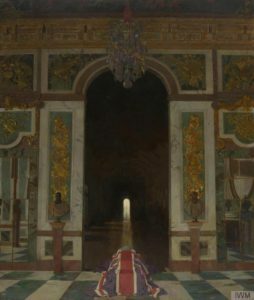 On the strength of his controversial but appreciated exhibition of his war work in 1917, the Imperial War Museum gave Orpen a major commission: three large group portraits to fittingly commemorate the solemn occasion, the kind of old fashioned thinking deemed appropriate even after such a modern war. Clearly, Orpen had been changed by what he had seen during the War and his sympathies lay with the ordinary British solider, the Irish farmer abroad, the rank and file, the Americans newly arrived. He observed the Treaty Conference dubiously, writing of the “frocks” or the diplomats who mingled with the high ranking officers all of whom seemed to be detached from the people who actually fought the war. “I admit,” he wrote, “that all these little “frocks” seemed to me very small personalities, in comparison with the fighting men I had come in contact with during the war.” Later on Orpen commented, The fighting man, alive, and those who fought and died—all the people who made the Peace Conference possible, were being forgotten, the “frocks” reigned supreme. One was almost forced to think that the “frocks” won the war. “I did this,” “I did that,” they all screamed, but the silent soldier man never said a word, yet he must have thought a lot.” With a flourish, the Treaty was signed and he wrote, The “frocks” had signed the Peace! The Army was forgotten. Some dead and forgotten, others maimed and forgotten, others alive and well—but equally forgotten. As the Conference ended, the book comes to an abrupt end, and a long line of sketches of soldiers in their duties, their native habitat, the battlefield, were interspersed with more portraits of the frocks and the officers and the leaders of the emerging nations, created by the war, such as, The Emir Feisul. There was one important plate that hinted of things to come, a nearly naked soldier clutching his gun, Blown Up. Mad. Orpen did his job with the large canvases skillfully, handling the group portraits as a good Dutch painter might, but he dwarfed the participants who quake under the magnificent timeless architecture that seems to mock their feeble efforts. 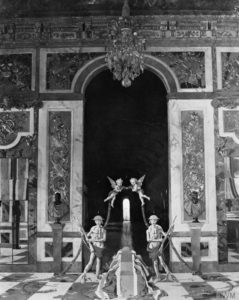 Even the choice of sites, Versailles, a palace so ancient and so historic, so utterly unmodern, was chosen by the French who wanted revanche on the Germans, who, decades ago, had forced them to their own palace, the place of King Louis, the Sun King, to sign the Preliminary Treaty of Versailles in the Hall of Mirrors. 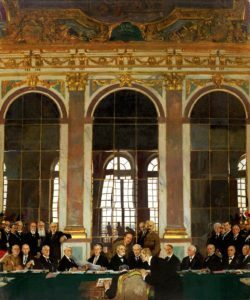 The Treaty was deliberately humiliatingly prelude for the Treaty of Frankfurt am Main also in 1871, ending the brief war, but adding on stunning reparations. And now the situation was reversed for the Germans. The Germans were back, but this time as the defeated. They would be made to suffer at the hands of the Allies. 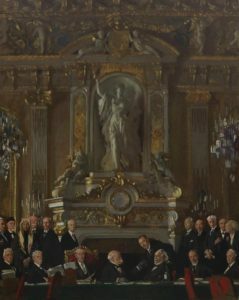 When this painting was exhibited in 1923, it caused a scandal, as might be expected, but only in official quarters, which was not mollified by the Renaissance references. The public, perhaps a bit wiser, voted it Picture of the Year. The Daily Herald praised it as ‘a magnificent allegorical tribute to the men who really won the war,’ Few in power knew that the clothes of soldiers were often blown off by explosions and those who survived would never be the same again. You had to be in the front lines to know this truth. The government had constructed its official version and Orpen’s nightmare vision of the insanity of war was not what was permitted. As Orpen said, “The only tangible result..is the ragged unemployed soldier and the Dead,” and he explained his painting as, “You know I couldn’t go on. It all seemed so unimportant somehow. In spite of all these eminent men, I kept thinking of the soldiers who remain in France forever. 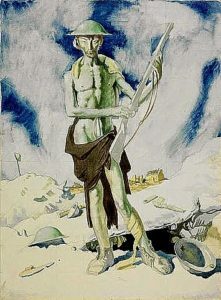 So I rubbed out all the statesmen and commanders and painted the picture as you see it – the Unknown Soldier guarded by his comrades.” The Imperial War Museum refused to pay for this painting, but in 1928 Orpen eventually painted out the cherubs and the naked soldiers, leaving the stark coffin as testament of the great loss the nation had suffered. In the far distance, a single archway filled with light beckons the Unknown soldier to eternity. The coffin lies in state, strangely British, assertive in its Union Jack attire in the midst of such French splendor. In the far distance, an arched doorway or window emits light, as if eternity were beckoning, or as if hope was trying to shine. The light lines up with and carves a path for the draped coffin to show it the way home. Everywhere else is gilt and over-elaborate marble walls and a green and white marble checkered floor. The decorated setting–pure French–is relieved by the blackness, the darkness of death. The soldier lying in state is unknown, one of the many who could not be identified, a sight familiar to Orpen who had seen these rows of graves at Thibault.